If you were one of the dozen or so people watching last Friday night’s game between Idaho and Boise St., you might have noticed a lone Auburn fan in the 16,000 seat Kibbie Dome, smiling and holding a “Cam Newton For Heisman” sign for the ESPN cameras. We tracked down the mystery man – Teddy Hall is his name – to find out via email if he enjoyed his time in Moscow, if Idaho was actually a real place, and if he really was planning a weekly Where’s Waldo-styled promotional campaign for Cam Newton’s Heisman candidacy (like he indicated in a message board post I can longer find). So what’s your Auburn story? I am an avid Auburn fan. Have been since I was 7 years old. I am currently 47 years young. I eat, sleep and talk Auburn 365 days a year. My hometown is Jasper, Alabama. where I graduated from Walker High School in 1981. I currently live in Spokane, WA where I am a real estate broker. What gave you the idea to go to the game like that? Did you already have a ticket and just decide to bring a poster / wear your Auburn gear? Or did you go to the game specifically to represent? I have a friend Robert Howard who is actually a Southern Cal fan who always wanted to see Boise St play. He became a closet Boise St fan ever since Boise St knocked off Oklahoma in one of the best college games ever in the Fiesta Bowl several years ago. Robert is a residential lender for a bank who refers me clients on a regular basis. I went online and purchased the tickets to treat him to a Boise St game as my way of saying thank you. I knew the Kibbie Dome was quite small only seating 16,000 people. And because of the media slamming Auburn and Cam Newton, I felt it was my chance make a statement on national tv and show some love and support for Auburn and Cam Newton. I felt there was a very good chance of being spotted since I was sitting only three rows from the field behind the Idaho bench. What was the reaction? Did people laugh? Flip you off? Ask you why? I arrived in Moscow, ID about an hour prior to the game. It was getting dark, cloudy and a cold 34 degrees. They have it set up where you have to walk through the tailgaters to get to the Kibbie Dome. The Idaho fans loved it since they thought I was there to mock Boise St’s Heisman hopeful Kellen Moore. Idaho fans were very hospitable and had tons of questions regarding Auburn, it’s traditions and of course Cam Newton. I was surprised many of them were not quick to judge him. Boise St fans not so much. Most of the heckling I received were from Boise State fans. Nothing too bad though. They want Auburn and Cam Newton to fall which will give them an inside track to the BCS title game and their Kellen Moore to win the Heisman. There were only a few Boise St fans that seemed to listen and have an open mind that if there were a smoking gun out there to get Cam Newton, that would have been presented by now and he’d been benched. By games end after getting to talk football for an entire game, I believe many Idaho Vandal fans who came up to me asking me a million questions and I gained mutual respect for each other’s programs. At least now they know why we say War Eagle when we’re the Tigers. They’ll be rooting for us the rest of the way! Did you know the cameras were on you? When did you know you’d made it on TV? Did someone call you? Were you recording the show and then saw it at home? Regarding the footage everyone has seen on TV, I had no idea the cameras were on me. That footage was taken just minutes after I got to my seat prior to the game. My buddy Robert went to the concession stand to get nachos prior to kickoff. So he was not next to me when they shot that. A couple of times during the game the ESPN camera guys came up to me to record me holding my sign. But they didn’t air it from what I understand. A few days prior to going to the game, I gave a heads up to my friends and family on Facebook and the Auburnfootball.com football forum my intentions of what I was going to do on national tv. 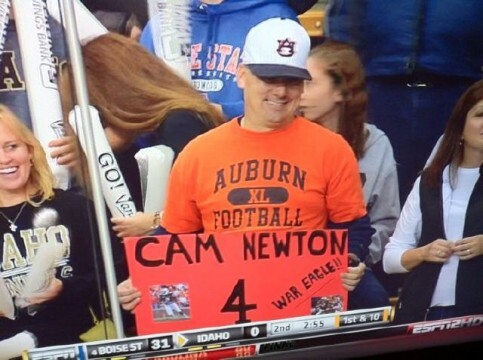 A lot of people who normally might not have watched the game watched to see if I would have success giving Auburn and Cam Newton love. I first learned of it from the blond lady (Tammy) an Idaho fan who everyone saw next to me. Someone texted her a portion of the video that saw her and then she showed me. My sister in Florida saw it and texted me, my brother in Birmingham texted me and I received a call from my dad who’s in Texas. For about 30 minutes I could not keep up with all the texting and calls I was receiving. I believe I was told they had me on the air for like 30 seconds and then showed me again later in the second half. So all I have is about an 8 second clip of that video emailed to me by my sister and some pictures that Idaho fan Tammy emailed me. Are you really planning on doing it again? Thinking of organizing an ‘Auburn Fan at Every Game’ campaign? I would love to do it again if I could. Getting tickets where I can be easily spotted is tough. I’ve also gone to a few Wazzu games since Spokane is about an hour and half from Pullman. I am never ever ashamed to wear my Auburn attire to these events. Creates great conversations amongst fans and gives me a chance to sell Auburn and educate fans up here about us. And BTW, Wazzu loves Auburn. Especially the fans who traveled to the plains when we beat them a few years back. They loved the hospitality Auburn showed them and the great atmosphere they never get to witness up here in the northwest. I know there are Auburn fans all over the country. I would like to challenge them to do the same when they attend sporting venues. What a great way to sell Auburn and educate people all across the country about our beloved University, traditions, family environment, sportsmanship and convert a few into new Auburn fans. That’s cool. Sounds like he represented Auburn very well. That would be awesome if the tradition started where any time any Auburn fans went to any sporting event they decked out in their Auburn gear as if they were in Jordan-Hare. hell to tha yeah Ted!!!! hope they had some BBQ for you there too!!!! He should go to an Oregon game!! That would be awesome. Washington State has a tradition of sending people to Game Day. Look for their flag. I haven’t seen a game day without it since i learned about the tradition back in 2006. I struck a conversation with a guy waving their flag that day. Pretty cool stuff. They literally ship flags around to make sure they are represented. I’d love to see it start up for Auburn.